(1) With unemployment still above 8%, the last thing the U.S. economy needs is a massive new tax on energy. (2) The EPA’s UMACT Rule and GHG Standard Rule each effectively bans the construction of new coal-fired power plants. (3) The GHG Standard Rule is a slippery slope that sooner or later will constrain gas-fired generation. (4) Adding carbon taxes to the GHG Rule could snuff out the shale gas revolution, especially if lifecycle analysis demonstrates that natural gas is actually as carbon intensive as coal or more so. (5) The UMACT/GHG Standard/Carbon Tax Combo could play havoc with electricity prices and reliability almost as much as Al Gore’s goofy plan to ‘repower America‘ with ‘zero carbon’ energy sources in 10 years. In short, the only defensible reason for ‘conservative’ economists to discuss carbon taxes is as a TOTAL replacement for ALL EPA greenhouse gas regulations. But that ‘progressives’ would agree to any such swap is unimaginable. So what really is there to talk about? Another pre-condition for any ‘conservative’ worthy of the name is that the carbon tax be ‘revenue neutral.’ That is, whatever revenues the carbon tax generates should be offset by reductions in other taxes. But how likely is it that ‘progressives’ would agree to apply Grover Norquist’s no-net-increase Taxpayer Protection Pledge to their beloved carbon tax? Again, unless ‘conservatives’ are willing to sell out, there’s no point in forming a left-right coalition on carbon taxes. Finally, whatever policy objectives the ‘conservative’ participants might have had in mind, the timing of the AEI-hosted pow-wow was all wrong. Any GOP expression of interest in carbon taxes at this time can only muddy the election-year battle lines between what may loosely be called the pro-tax/anti-energy party and anti-tax/pro-energy party. It is also entirely unclear at this point what kinds of concessions might have to be made in 2013 to rein in the EPA. For example, a clean sweep in the November elections might make the GOP strong enough to limit the regulatory fallout from Massachusetts v. EPA without endorsing carbon taxes. As you’ll see in the comments posted there, it’s a hot topic, but it’s hard to find an economist who won’t tell you that a carbon tax is the most effective climate policy. Harvard Prof. Greg Mankiw, who advised McCain and Romney started the “Pigou Club” to list all the economists who have made this point. See “Smart Taxes: An Open Invitation to Join the Pigou Club” (Greg Mankiw, Harvard, 2008) at http://www.economics.harvard.edu/files/faculty/40_Smart%20Taxes.pdf. There is no “defensible reason for ‘conservative’ (or any other) economists to discuss carbon taxes”. It is like agreeing to be hit in the head with a baseball bat instead of a lead pipe. Why accept being hit at all when the objective of all these initiatives, the fight to stop climate change”, is hopelessly misguided? Lets stick to the climate realist message, folks. There is no need to control carbon dioxide emissions. There is no reliable, convincing evidence that it is causing dangerous climate change. See the Nongovernmental International Panel on Climate Change (www.nipccreport.com) for much more on this. Why are conservatives even cavorting with the liberal, leftist elites? Are they part of the One-World Global Government surge, too? Are conservatives “snatching defeat from the jaws of victory,” as so many peer-reviewed papers refuting catastrophic man-made global warming have been published in the past 3 years? James, thank you for clarifying your position on carbon taxes vs. EPA greenhouse gas regulations. You favor swapping the one for the other rather than piling carbon taxes on top of EPA’s rules. That may have a certain appeal as a blackboard exercise, but you are asking us to believe that your proposal would come out of the sausage factory with all its parts and purity intact. The notion that Washington’s revenue hungry politicians would enact a massive new tax that would simply displace current tax burdens dollar for dollar rather than add to them is, I think, naive. Some interests would clamor for the carbon tax revenues to be used to subsidize alternative energy. Others would want the money for roads and infrastructure. Others would insist that a portion be used for deficit reduction. I notice that “deficit hawks” gave presentations the AEI hosted “Price Carbon Campaign/Lame Duck Initiative” meeting. Of what use is a “revenue neutral” carbon tax to “deficit hawks”? More importantly, even if revenues from the carbon tax were used to reduce income tax rates in the first year or so, nothing would prevent a later Congress from undoing that part of the deal. 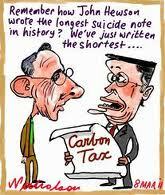 We could end up with the same old income tax plus the newfangled carbon tax. Compromises are also likely on the regulatory side, because it is not at all clear why those who litigated and won Mass. v. EPA would follow your lead. Those organizations invested millions of dollars, years of effort, and thousands of billable hours to help their favorite agency establish and grow its greenhouse regulatory empire. Why would they scrap that for a carbon tax? Litigation is their bread and butter. Controlling and punishing “polluters” is their thrill. The grand bargain you propose would dismantle the regime they have built, curb their influence, and spoil their fun. In a genuine grand bargain, environmental groups would have to sacrifice more than just EPA’s greenhouse gas regulations. They’d also have to agree to repeal of the renewable fuel standard. And they’d have to pledge (for whatever that’s worth) not to lobby for a national renewable portfolio standard, a national clean energy standard, or a national low-carbon fuel standard. There would also have to be preemptions; otherwise we could end up with a national carbon tax plus a patchwork quilt of State-level GHG regulations. But try to imagine the California Air Resources Board supporting a carbon tax that requires it to give up its EPA-awarded power to impose de facto fuel economy standards on the auto industry. Ha! So we come back to the sausage factory. The only deal California and environmental groups would even consider is one in which they get carve outs for regulatory sacred cows. It is doubtful negotiations would ever get that far. There was no hint of a grand bargain in the “Price Carbon Campaign” agenda, in coverage of the Bob Inglis carbon tax initiative, or in the puff piece on George Shultz and carbon taxes. Finally, even if the AEI meeting discussed this topic – outsiders may never know – why should the rest of us regard such talk as anything other than the bait for a bait-and-switch? As the agenda says, the “Price Carbon Campaign” is a “Lame Duck Initiative.” That suggests a plan to defy public sentiment as expressed in the November elections. How novel! The real point of Mass v. EPA was to empower the EPA to bypass Congress and ‘enact’ an agenda the people’s representatives would not approve if put to a vote. Similarly, the reason most environmental groups lobbied for cap-and-trade rather than a carbon tax was simply to fool the public. People have a long and unpleasant familiarity with taxes. Cap-and-trade was new and strange and most people outside-the-beltway did not know it was a stealth energy tax. During the cap-and-trade debate, some clever people said Republicans and coal-State Democrats needed to support carbon taxes as an alternative because “you can’t beat something with nothing.” They were wrong. We beat cap-and-trade by exposing it as capntax. It would be folly now for friends of affordable energy to support an open, avowed, unvarnished energy tax. The November elections could significantly strengthen our clout in the nation’s capital, creating real opportunities to roll back or at least limit EPA’s greenhouse power grab.